From legendary Russian Porcelain factory, Lomonosov tradition, dating back to the 1700"s from the cultural center of St. Petersburg. 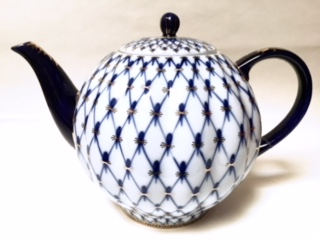 A glimpse into the opulent imperial era in its ceramic designs and works of art. Intricate 22 karate gold net pattern. 10 1/4" teapot width from spout to handle. & 7' in height.